What is Flammable Chemical Storage? Flammable chemical storage is any chemical or substance that can be ignited. Flammable chemical storage can be liquid, or solid substances that ignite easily and burn rapidly. Flammable chemical storage must be maintained and managed continuously and stored properly. Flammable liquids consist of a flash point less than 100°F. Many organizations that are involved in manufacturing processes store large quantities of flammable chemical storage, including flammable liquids and flammable solids. It is extremely important that flammable chemical storage be compliantly stored and maintained correctly. Large organizations are subject to chemical audits and regular compliance checks, so proper storage is necessary. Safety Engineers, Environmental Engineers, Compliance Managers, and Safety Managers all play a major role in monitoring chemical storage within large organizations. Managing your chemical storage also provides a safe work environment and promotes environmental safety to the public. Many organizations store large quantities of different chemical inventory that requires segregated types of storage containers. U.S. Chemical Storage offers 100% customizable chemical storage buildings and accessories that provide compliant storage solutions for separate chemicals. U.S. Chemical Storage offers solid partition walls for safety and security measures, when storing incompatible hazardous materials. Keeping your flammable chemical storage compliantly stored can benefit your plant operations and provide efficient manufacturing operations. When properly storing flammable chemicals, manufacturing operations can become more streamlined and provide effective management capabilities for plant managers. 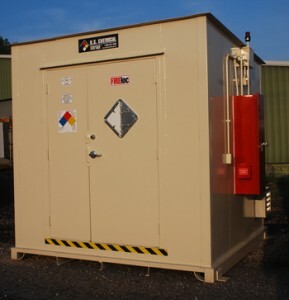 U.S. Chemical Storage provides 100% customizable flammable chemical storage buildings for large organizations. We offer fully compliant, 100% customizable flammable chemical storage buildings to meet your specific chemical storage needs. U.S. Chemical Storage offers fully compliant chemical storage with our FIRELoc, 2-hour fire rated storage building and our SUPERLoc, 4-hour fire rated chemical storage building. When storing flammable liquid storage, additional features to a chemical storage building can be necessary. We offer 100% fully customizable parts and accessories that ensure compliant storage. We offer expert advice on all of our products and accessories for complete protection. Our FIRELoc and SUPERLoc chemical storage buildings feature a leak-proof, secondary sump containment in case a flammable liquid spill or leak were to occur. Built from heavy-gauge, metal steel construction for superior strength and durability. U.S. Chemical Storage offers the ultimate flammable storage buildings on the market.